CHARLESTON, SC (WCSC) - The WCSC Live 5 First Alert Weather team is committed to you and your family's safety during any severe weather. As part of our most critical mission of providing public safety information to our community, the team created the First Alert Weather Day concept to help alert members of our community to potential weather dangers quickly and provide more information about impacts and other important information like business and school closings and event cancellations when they happen. The life of one viewer is a far higher priority than any entertainment program we can provide. We follow specific guidelines for interrupting programming. If there is a National Weather Service-issued tornado warning for any one of the counties we serve, we will provide continuous coverage until the warning expires or we no longer see a significant threat to lives or property. WCSC will make every attempt during these programming interruptions to work with CBS and other syndicated partners to provide and re-air these interrupted programs at a later time in their entirety. During less impactful severe weather events, such as tornado watches or thunderstorm warnings, we will use our crawl and map system to provide viewers ongoing weather updates. However, some thunderstorms can produce wind shear as strong as weak tornadoes. During these events, we may elect to interrupt programming and provide updated tracking and analysis. We may also choose to interrupt programming when strong to severe storms are moving into highly populated areas during peak travel times or during major outdoor events. In short, if threatening conditions are possible in the Live 5 viewing area, we will declare a First Alert Weather Day to give viewers the most advance warning possible - even before a watch or warning is issued by the National Weather Service. First Alert is all about alerting you, protecting you, and keeping your family safe. We want to give you as much time as possible to plan and ensure you are adequately prepared for these events. You'll see our profile pictures on Facebook and Twitter change to a special, red First Alert Weather Day icon. You'll see a Live 5 First Alert Weather Day story on Live5News.com, which will also be sent as an alert on your Live 5 First Alert Weather Mobile App. We'll also link you to this story on our social media platforms including Facebook, Twitter and Instagram. During the broadcast day, you will notice a red Live 5 First Alert Weather Day icon on your television screen. 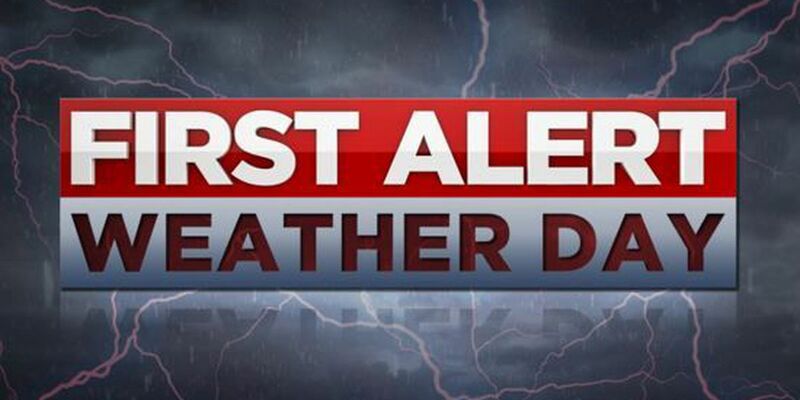 Our newscasts will open with a special announcement stating a Live 5 First Alert Weather Day has been declared, and you will see additional special graphics throughout our newscasts and weather segments. We'll also alert you on mobile and on social media if there have been changes to storm timelines, storm strength, and other factors which affect and impacts the details of the First Alert Weather Day. Why don't you simply crawl the information at the bottom or top of the screen? We simply cannot provide the street by street and neighborhood tracking through a crawl system. Plus, severe weather may be impacting multiple counties, and storms often gain strength and weaken during a weather event. It would be too confusing for the viewer to scroll pages of text across the screen. I have seen the wording strong storm indicated by your crawl and map system. What does this mean? A strong storm is a storm that is not technically severe by National Weather Service standards, but still may cause minimal property damage. Typically, strong storms produce winds between 30 and 50 mph. Why are there so many tornado warnings with often few reports of damage? Doppler radar technology has improved exponentially in the last decade. We now have the ability to detect circulation within thunderstorms. While this has increased the warning lead time and has helped save literally thousands of lives, it does come with a drawback. Radar does an excellent job of detecting what is happening in the air, but not on the ground. As late as the 1980s, tornadoes were often already on the ground doing damage before a warning was issued.